Now with the power of Zirconium! 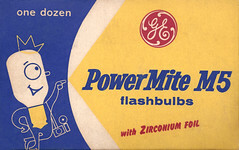 One dozen GE PowerMite M5 flashbulbs with Zirconium foil. Love the little mascot on this box. And how often do you get to see the GE logo in red? Three color print on white, uncoated cardboard sleeve.